August 10, 2007John F. Kennedy Space Center Americas gateway to the universe Spaceport News http://www.nasa.gov/centers/kennedy/news/snews/spnews_toc.html Vol. 46, No. 16 STS-118 crew members proud of modified EndeavourNASAs Phoenix begins journey to sample Mars water (See PHOENIX, Page 7) THE DELTA II rocket carrying NASAs Phoenix Mars lander launches from Pad 17A on Cape Canaveral Air Force Station. Phoenix will land in icy soils near the permanent ice cap of Mars in May 2008.By Linda Herridge Staff Writer A t press time, the Space Shuttle Endeavour and the STS-118 seven-member crew were scheduled to lift off from Launch Pad 39A on Aug. 8. Commander Scott Kelly will lead Pilot Charlie Hobaugh and Mission Specialists Tracy Caldwell, Alvin Drew, Rick Mastracchio, Barbara R. Morgan and Dave Williams on the scheduled 11-day mission. The 22nd flight to the International Space Station will be the first mission for Morgan, the teacher-turned-astronaut whose association with NASA began more than 20 years ago. The mission also marks the first flight for Endeavour since 2002. An excited orbiter team cheered as Endeavour made its way from the Orbiter Processing Facility to the Vehicle Assembly Building last month for mating to its external tank and solid rocket boosters. After spending nearly five years in the facility for intense orbiter modification and maintenance, known as OMM, Endeavour was ready to fly. When the OMM and returnto-flight modifications were completed in June, the team had inspected, tested, repaired, replaced, modified or upgraded practically every piece of the orbiters components. 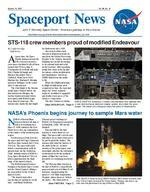 The first station-to-shuttle (See ENDEAVOUR, Page 4) N ASAs Phoenix Mars mission blasted off Aug. 4 and is now aiming for a May 25, 2008, arrival at the Red Planet for a close-up examination of the surface of the northern polar region. Perched atop a Delta II rocket, the spacecraft left Cape Canaveral Air Force Base Launch Pad 17A at 5:26 a.m. The spacecraft established communications with its ground team via the Goldstone, Calif., antenna station of NASAs Deep Space Network at 7:02 a.m. after separating from the third stage of the launch vehicle. The NASA Launch Services Program at Kennedy Space Center and the United Launch Alliance are responsible for the Delta II launch service. The launch team did a spectacular job getting us on the way, said Barry Goldstein, Phoenix project manager at NASAs Jet Propulsion Laboratory in Pasadena, Calif. We are all thrilled! Phoenix will be the first mission to touch water-ice on Mars. The spacecrafts robotic arm will dig to an icy layer believed to lie just beneath the surface. The mission will study the history of the water in the ice, monitor weather of the polar region, and investigate whether the subsurface environment in the far-northern plains of Mars has ever been favorable for sustaining microbial life. The Phoenix Mars mission is the first of NASAs competitively proposed and selected Mars Scout missions, supplementing the agencys core Mars Exploration Program, whose theme is follow the water. The University of SPACE SHUTTLE Endeavours cockpit instrumentation was replaced with a new multi-functional electronic display system, also called the glass cockpit. The orbiter has undergone nearly five years of modifications. SPACEPORT NEWS August 10, 2007 Page 2 AwardsT he National Space Club of Florida will recognize space pioneers Norris Chief Gray, Jay Honeycutt and Charlie Murphy with the 2007 Lifetime Achievement Awards during a luncheon at 11:30 a.m. Aug. 14 at the DoubleTree Hotel in Cocoa Beach. Jay, Charlie and Norris each have made significant contributions to the space community through their impressive careers, said Adrian Laffitte, chairman of the non-profit organization. The Space Club is proud to acknowledge their achievements. Gray, retired since 1984, still serves as a NASA public affairs volunteer with almost 60 years of involvement in rocket launching activities at Cape Canaveral and Kennedy Space Center, spanning from the Bumper rocket launch to the Space Shuttle Programs STS117 mission. His spaceport career began in 1949 at the Joint LongRange Proving Ground before moving on to the Cape Canaveral National Space Club honors three with Lifetime Achievement Awards Missile Annex as fire chief and emergency preparedness officer. Honeycutts career has spanned almost the entire history of the U.S. human spaceflight program. He served as director of Kennedy Space Center and director of shuttle management and operations at KSC. He was responsible for engineering management and technical direction of preflight, launch, landing and recovery activities for shuttles. Honeycutt served as special assistant to the associate administrator for spaceflight, and coordinated Presidential Commission and Congressional activities related to the Challenger accident. He retired from a Lockheed Martin program vice president position in 2004. Murphy, a recently retired senior executive for United Space Alliance, is a 48-year veteran of aerospace launch operations. He has served critical roles on theFROM LEFT, Norris Chief Gray, Jay Honeycutt (pictured left) and Charlie Murphy will be honored by the National Space Club of Florida with Lifetime Achievement Awards on Aug. 14 at the montly luncheon. XSM-64 Navaho Program; the Titan, Atlas and Minuteman Intercontinental Ballistic Missile Programs; the S-II stage of the Saturn V; the Apollo Command and Service Module; and the Space Shuttle Program, where he directed launch and landing operations and all orbiter logistics. For reservations, contact LaDonna Neterer at 867-0895 or LaDonna.J.Neterer@boeing.com T he crew members for NASAs STS-120 mission recently completed their Crew Equipment Interface Test, or CEIT, at the Kennedy Space Center. Among the activities standard to a CEIT are harness training, inspection of the thermal protection system and camera operation for planned extravehicular activities. The STS-120 mission will deliver the Harmony module, christened after a school contest, which will provide attachment points for European and Japanese laboratory modules on the International Space Station. Also known as Node 2, it is similar to the six-sided Unity module that links the U.S. and Russian sections of the station. Built in Italy for the United States, Harmony will be the first new U.S. pressurized component to be added. The STS-120 mission is targeted to launch on Oct. 20. Visit www.nasa.gov/shuttle for the latest update.STS-120 crew members complete test for October mission INSPECTING THE thermal protection system, or TPS, tiles under Space Shuttle Discovery in Orbiter Processing Facility bay 3 are, from left, Expedition 16 Flight Engineer Daniel Tani; Mission Specialist Douglas Wheelock; Pilot George Zamka; Mission Specialist Paolo Nespoli (sitting), a European Space Agency astronaut from Italy; Mission Specialist Scott Parazynski; Commander Pamela Melroy; Allison Bolinger (kneeling), an EVA technician with NASA; and Mission Specialist Stephanie Wilson. STS-120 CREW members handle tools they will use during the mission. Around the table, from left with flight suits, are Mission Specialists Scott Parazynski, Douglas Wheelock, Paolo Nespoli and Expedition 16 Flight Engineer Daniel Tani. GIVING A close inspection to Discovery are Mission Specialist Stephanie Wilson (left) and Commander Pamela Melroy. SPACEPORT NEWS Page 3 August 10, 2007 Hail monitoring system provides accurate analysis JOHN LANE, an ASRC Aerospace engineer, kneels next to the hail monitoring system. Other developers of the monitor include, from left, Joe Dean, Bill Haskell, Bob Cox and Dr. Bob Youngquist. August NASA employees of the month By Jeff Stuckey Editor B etween the late-February hailstorm that forced Space Shuttle Atlantis to roll back from Launch Pad 39A to the Vehicle Assembly Building, to the July torrential rainstorms that brought the potential for more hail, Kennedy Space Center engineers have been relying on a new hail detection system more than ever. NASA and ASRC Aerospace engineers have developed a special hail monitor, called the size distribution impact transducer, to better detect and assess hailstorms that could damage a space shuttle or its fuel tank while standing on a launch pad. The shuttles have been struck five times while at the pad undergoing preparation for launch. The new hail monitoring system was first used at Launch Pad 39B for last years STS-115 mission. Armed with this hail impact data, a more informed judgment can now be made as to the size, depth and number of damaged sites to expect, and the possible type of repair that may be required, said Charlie Stevenson, NASA technical assistant to the shuttle chief engineer. When fully deployed, the hail monitor will transmit data back to the Launch Control Center. This is another great example of NASA ingenuity. The original hail detection system used sheets of aluminum foil stretched over Styrofoam, a system developed by Colorado State University. The foil revealed when hail struck an area by showing large indentations on the surface. The need for an advanced system became apparent after hail struck Space Shuttle Discovery in May 1999 while awaiting launch for STS-96. The hail monitors have not replaced manual inspections after a storm, but rather supplement visual inspections. Engineers retrieve information from the monitors at the launch pad. According to ASRC Aerospace engineer John Lane, the sound of rain deflecting off a vehicle is distinctly different than the sound produced by falling hail. The sound of hail is not only louder, it also contains higher frequencies due to its hardness. The hail monitor sensor is a metal plate in the shape of a shallow pyramid which deflects hail from the sensor surface after one hit, thus preventing multiple bounces from the same hail stone, Lane said. A microphone pickup is mounted beneath and in the center of the metal plate. The output of this microphone is connected to an electronic circuit which digitizes and processes the microphone signal. By placing three hail monitoring systems close to the launch pad, any hail striking the shuttle or the launch pad structures can be detected by the monitors and recorded by the liquid crystal display, or LCD, counters. Ground operations personnel check the counters daily when a vehicle is on the pad. Lane said by performing special data processing, the hail data, coupled with velocity data, can be merged into a four-dimensional picture showing space and time of hail size distributions. Specific impact areas can then be pointed out for inspection crews immediately following a hail storm. T he August NASA employees of the month include, from left, Renee Debing, Information Technology and Communications Services; Fayann Hull, External Relations; Sheila Plourd, International Space Station and Spacecraft Processing; Tammy Burlein, Procurement Office; Damara Belson, Chief Financial Office; Maurice Lavoie, Center Operations; Theresa Kroning, Launch Services Program; Giselle Altman, Engineering Directorate; and Vera Murphy, Safety and Mission Assurance. Page 4 SPACEPORT NEWS August 10, 2007 Endeavour ready to fly after major modifications ENDEAVOUR . .(Continued from Page 1)power transfer system was installed in Endeavours payload bay. The orbiter also received return-to-flight modifications including the orbiter boom sensor system, wing leading edge instrumentation and a digital external tank separation camera. NASA Launch Director Mike Leinbach said the changes make Endeavour quite unique. In particular, the station-to-shuttle power transfer system work makes the orbiter a more flexible ship to support the continuing construction of the station by allowing for longer docked times with the station. The orbiter also carried with it something not visible  the hopes and dreams of hundreds of NASA, United Space Alliance and Boeing engineers, planners, technicians, quality inspectors and many others who painstakingly worked around the clock to prepare the vehicle for flight. During the OMM, the processing team completed 195 modifications and 205 special tests, according to Tassos Abadiotakis, Endeavours flow director since 2000. This was a long and challenging flow for the team and Im really proud of their hard work and dedication, Abadiotakis said. Extensive structural and wiring inspections were completed on the vehicle. Approximately 150 miles of wiring was inspected and many components were removed to gain access to the vehicles airframe for inspection. The orbiters cockpit instrumentation was gutted and replaced with a new multi-functional electronic display system, also called the glass cockpit. A global positioning satellite system was added and the cockpits outermost windows on each side were replaced with thicker window panes. Approximately 2,045 tiles were removed and replaced, and 72 Boeing reusable insulation tiles were installed in critical areas on wing leading edges, and main and nose landing gear doors. All wing leading edge reinforced carboncarbon panels were removed and inspected using non-destructive evaluation. A record-breaking 2,000 thermal control system insulation blankets were removed from inside the vehicle and either refurbished or replaced. This was a unique flow with the large volume of work accomplished by a lot of great people, said Mike Parrish, USAs operations chief for orbiter Endeavour. Among the major components removed, inspected and reinstalled were the remote manipulator system, forward reaction control system, orbital maneuvering system pods, rudder speed brakes and body flap. Every orbiter system was inspected and tested, including the hydraulics, electrical and main propulsion systems. The vehicles mechanisms, communications systems, environmental control life support system, fuel cells, structures, cryogenics and flight controls were also tested. TECHNICIANS REINSTALL the remote manipulator system (above) in Endeavour as part of the orbiter modification and maintenance. At left, a technician inspects one of 2,045 tiles that were replaced. M ore than 400 participants attended the Innovative Strategies for Cultivating the STEM (Science, Technology, Engineering and Mathematics) Conference in Orlando and at the Kennedy Space Center on Aug. 5-8. They included educators of kindergarten through 12th grades, university faculty and students, informal education leaders (from science centers, the Girl Scouts and others), and companies such as Microsoft and Google. The conference focused on discussing innovative programs at all educational levels to attract and retain more students in science, technology, engineering and mathematics disciplines to help build the technical work force of the future. The conference was sponsored by NASAs Office of Education and the Space Operations mission directorate. Teachers in space conference helps build future work force FORMER NASA astronaut Robert Springer talks to attendees of the teachers in space conference in the Apolllo/ Saturn V Center. Page 5 SPACEPORT NEWS August 10, 2007 T he Kennedy Space Center Visitor Complex and the Netflix Live! on Location concert and movie series teamed up to offer a live concert with the Bruce Willis Blues Band on Aug. 2 in the Rocket Garden. The concert was followed by a free outdoor screening of the 1998 Academy Award-nominated classic Armageddon, which included scenes filmed at the center. The series pairs a free screening of a popculture movie classic with a live musical performance by one of the films featured stars in locations uniquely associated with the movies. Entertainment correspondent and actress Maria Menounos hosted the event and introduced the band and the film. Bruce Willis Blues Band, Armageddon screening entertains guests at Visitor Complex THE BRUCE Willis Blues Band begins performing in the Rocket Garden at the Netflix Live! on Location concert held Aug. 2. BRUCE WILLIS (right) plays harmonica during the concert. The actor also appeared in the movie Armageddon shown after the music performance. THE AUDIENCE, estimated between 6,000 to 7,000 people, was able to bring lawn chairs to enjoy the Armageddon screening. For the day, the Visitor Complex set a one-day attendance record of 9,400 people. The Netflix Live! on Location concert series pairs a free screening of a movie classic with a live musical performance by one of the films featured stars in locations associated with the movie. CENTER DIRECTOR Bill Parsons welcomes the crowd to the concert while host Maria Menounos looks on. THE CROWD at the Netflix Live! on Location concert at the Visitor Complex welcomes The Bruce Willis Blues Band to the stage. SPACEPORT NEWS August 10, 2007 Page 7 Remembering Our Heritage THE ORBITER Enterprise soars above the NASA 747 carrier aircraft only seconds after separating during the first free flight of the shuttle Approach and Landing Tests. Astronauts Fred Haise (left) and Gordon Fullerton were the crew members of the Enterprise.By Kay Grinter Reference Librarian O n Aug. 12, 1977, astronauts Fred Haise and Gordon Fullerton took the orbiter Enterprise for the first piloted free flight during the Approach and Landing Test, or ALT, program for NASAs new manned vehicle, the space shuttle. Sixteen various exercises were conducted altogether, culminating in five free flights. The free flights were designed to verify the orbiters subsonic airworthiness, the operation of its integrated system, and its pilotguided approach and landing capabilities. The crew was trained to separate the orbiter from atop the Shuttle Carrier Aircraft, or SCA, and glide to a landing on a dry lake bed at Edwards Air Force Base in California. During the first free flight, a tail cone was installed over the orbiters dummy main engines to reduce buffeting. Roy Tharpe is the deputy site leader for Boeing Florida Operations at Kennedy Space Center. From 1975 to 1977, though, he lived in Lancaster, Calif., and was NASAs manager of the Shuttle Test Support Office at Dryden Flight Research Center.30 years ago: First free flight for shuttle orbiter draws a crowd The office staff was made up of employees assigned from three space centers, Tharpe recalled. A Johnson recruit interacted with the flight crews, a Dryden employee coordinated the logistical support, and Kennedy provided a manager  me  and a console operator, Don Eversberg. I was the go-to guy for anything and everything that had to do with test support for ALT ground operations. The first free flight was the first test to require all aspects of an actual shuttle mission: ground processing to prepare the orbiter and SCA for flight, a mission profile, and landing and postlanding ground operations. In flight, the SCA performed a shallow dive on cue, and Haise triggered the explosive bolts linking the two aircraft. Enterprise lifted free. One of the redundant computers on the orbiter failed at separation, cutting off flightcontrol accelerometers but without affecting the flight. Both astronauts gave the orbiter a good evaluation. Enterprises handling qualities were better than experienced in our simulators, Haise reported. Fullerton described its performance as like a fighter aircraft, rather than a freighter. After flying free for 5 minutes, 22 seconds, Enterprise touched down on Rogers Dry Lake at a speed of 207 miles per hour and rolled about two miles before coming to a stop. Approximately 70,000 spectators braved the heat in the Mojave Desert just after 9 a.m. Pacific time for the orbiters historic first landing. Arizona was selected to lead the mission in August 2003 and is the first public university to lead a Mars exploration mission. Phoenix uses the main body of a lander originally made for a 2001 mission that was cancelled before launch. Samples of soil and ice collected by the landers robotic arm will be analyzed by instruments mounted on the deck. One key instrument will check for water and carbon-containing compounds by heating soil samples in tiny ovens and examining the vapors that are given off.PHOENIX . (Continued from Page 1)The lander carries seven instruments. They include the robotic arm, which will dig into the ground and deliver samples to two instruments for analysis; the robotic arm camera, which will provide close-up color images of the soil and ice; the thermal and evolved-gas analyzer that will heat soil samples delivered by the arm and measure how much water vapor, carbon dioxide and volatile organic compounds are given off as the temperature climbs; the microscopy, electrochemistry and conductivity analyzer; the surface stereo imager; the meteorological station; and the Mars descent imager, which will provide geological context for the landing site. ON LAUNCH Pad 17A at Cape Canaveral Air Force Station, the first half of the fairing is moved into place around the Phoenix Mars lander for installation. The spacecraft is scheduled to land on Mars on May 25, 2008, for a close-up examination of the surface of the northern polar region. Page 8 SPACEPORT NEWS August 10, 2007 John F. Kennedy Space Center Managing editor. . . . . . . . . . . . . . . . . . . Amber Philman Editor. . . . . . . . . . . . . . . . . . . . . . . . .Jeff Stuckey Copy editor . . . . . . . . . . . . . . . . . . . . .Corey Schubert Editorial support provided by InDyne, Inc. Writers Group.NASA at KSC is located on the Internet at http://www.nasa.gov/centers/kennedyUSGPO: 733-049/600139 Spaceport News Spaceport News is an official publication of the Kennedy Space Center and is published on alternate Fridays by External Relations in the interest of KSC civil service and contractor employees. Contributions are welcome and should be submitted two weeks before publication to the Media Services Branch, IDI-011. E-mail submissions can be sent to Jeffery.Stuckey-1@ksc.nasa.gov. Intercenter Walk/Run set for Sept. 18 at landing facilitySPACEPORT EMPLOYEES line up for the start of last years Intercenter Walk/Run at the Shuttle Landing Facility. This years 2-mile walk/run, 5K run and 10K run events are scheduled for Sept. 18. T he Kennedy Space Center Fitness Centers are sponsoring the Intercenter Walk/ Run which will start at 5 p.m. on Sept. 18 at the Shuttle Landing Facility. The 2-mile walk/run, 5K run and 10K run are free for all spaceport employees. Stop by either fitness center by Sept. 14 to pre-register. Late registration will take place at the race. T-shirts may be ordered at any NASA Exchange store beginning Aug. 13. The order deadline for T-shirts is Sept. 7. Anyone interested in helping out should call 867-7829 or e-mail Debra.L.Orringer@nasa.gov By Steven Siceloff Staff Writer S PACEHAB is preparing to close the hatch on its shuttle research and cargo carrier enterprise 14 years after its first pressurized module flew into space on an orbiter, while the company begins its strategic journey into space-based microgravity processing. The company provided its first space-rated travel trailer of sorts to NASA in 1993. Later, the design would come in especially handy for missions to the Mir space station and during the construction of the International Space Station. The single module bolted into Endeavours cargo bay will continue that work by carrying some 5,800 pounds of equipment and supplies to the International Space Station, according to Don Moore, director of ground operations at the companys Cape Canaveral facility. Pete Paceley, SPACEHAB Flight Services vice president said, It is a transition flight for us and were excited about the demonstration tests for microgravity processing that were flying, as well. The space agency could still enlist a pressurized module for a shuttle supply run in the future, but the flight manifest currently leaves that task to the Italian-built multi-purpose logistics modules, or MPLMs.THE LAST SPACEHAB module is loaded for transport to Endeavours cargo bay for the STS-118 mission. Last SPACEHAB module assists STS-118 mission The MPLMs are built to attach directly to the space station during a shuttle mission, but still come back with the orbiter. A module from SPACEHAB remains in the cargo bay during the entire flight. Since flying its first pressurized module in 1993 aboard STS-57, the company has claimed the mantle of a successful aerospace corporation by catering to researchers and others willing to pay to get their experiments into space and back aboard an orbiter. The hundreds of past experiments carried out aboard the modules include aerogel, the super-lightweight substance that became the centerpiece of the Stardust mission to gather particles from interstellar space. Just packing the module takes considerable planning, especially considering that some of the bags have to be loaded while the module is on its back inside Endeavour at the launch pad. The loaders devise a complex choreography to get the 5,800 pounds of gear on racks and stacked in bags exactly where the astronauts expect to find the items. In the case of STS-118, the crew can expect a tight fit in the module because of all the gear strapped to the walls. The good news is that what seems like a tight fit on Earth opens up significantly in space, where the lack of gravity lets astronauts float up to the modules window.